Based on image at <www.gobant.gov.co>. There is unrecognizable yellow device in the centre. The unrecognizable yellow device in the center is an 8 point star. La Estrella means The Star in Spanish, and thats why they have a star in their flag. "El autor es el señor Jorge Iván Cadavid Aguirre. Está formada por tres fajas horizontales del mismo ancho, y en la faja central una estrella de ocho puntas. El Azul significa la justicia, la dulzura, la lealtad y la piedad. El Blanco significa el color de la paz. El Verde significa el paisaje que caracteriza el municipio, también la esperanza, la integridad, el silencio y la fraternidad. The designer of the flag is Jorge Iván Cadavid Aguirre. The flag is made of three equal horizontal stripes with an eight-pointed star in the central stripe. Blue symbolizes justice, gentleness, loyalty and piety. White is the colour of peace. Green symbolizes the characteristic landscape of the municipality, as well as hope, integrity, silence and fraternity. 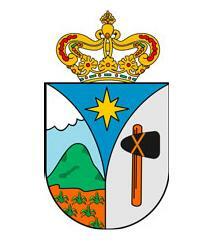 More information after the municipal website: La Estrella (55,746 inhabitants in June 2004 - Siderenses; 35 sq. km; mean elevation, 1,775 m asl, maximum elevation 2, 800 m [Alto de Romeral]) is located in the southern part of the Valle del Aburrá, 16 km south of the town of Medellin. The village of Nuestra Señora de la Estrella was founded by a Decree signed on 4 September 1685 by Francisco Carillo de Albornoz, Governor of the Province of Antioquia. This followed a petition sent to the Governor by the Anaconas, requiring the creation of a new village. The first colony was set up in a place called Ancón and later transferred to its present location, where the climate was better and the water resources more numerous. La Estrella was granted the status of municipality in 1883. The name fo the municipality (lit., the Star) recalls that an inhabitant of the early colony once found a golden star in a brook. However, it is most probably related to "Maris Stella", one of the traditional titles of the Blessed Virgin. La Estrella is part of Area Metropolitana Valle de Aburra (Antioquia Department). It's flag is a yellow- green-red horizontal triband.